Manual, where you would have to drag the magic magnifier from the NPRW window to the field with asterisks. Automatic, where the recovery application will automatically search for all the **** fields in all open windows on your desktop. Both cases assume a number of restrictions. Some applications have their own GUI, and therefore Asterisks Revealer may be unable to interact with such applications. Those include Opera, Mozilla, Firefox, etc. Some websites have a built-in protection, which hides either the garbage or the actual asterisks behind the asterisk characters * (asterisks hidden behind asterisks!). 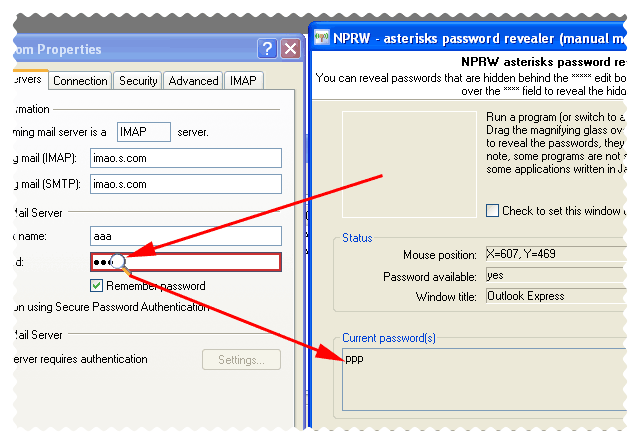 In some Windows system dialogs asterisks also hide the * character and not the real password. But that happens mainly because Windows stores the majority of its passwords as a hash rather than as plain text. Hence, there is just nothing to hide there. To ensure the proper operation of this tool, you are to have the administrator privileges. In Windows Vista, make sure that the option 'Run this program as an administrator' on the application shortcut's context menu is enabled. Just drop the magnifying glass to the **** field. Ensure that you view this page with Microsoft Internet Explorer 5 or better. 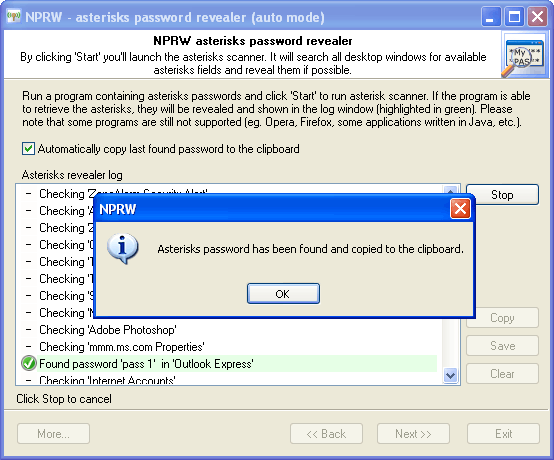 Run the program and select Asterisks Password Revealer manual mode. To reveal the passwords, drag the magnifying glass over this Internet Explorer window with the password boxes. Or let the program do it.